LiveRoof® Selected for 22,800-Square-Foot Green Roof, Part of a Multi-Million Dollar Makeover and Expansion of Harrah’s Cherokee Casino & Hotel in North Carolina. 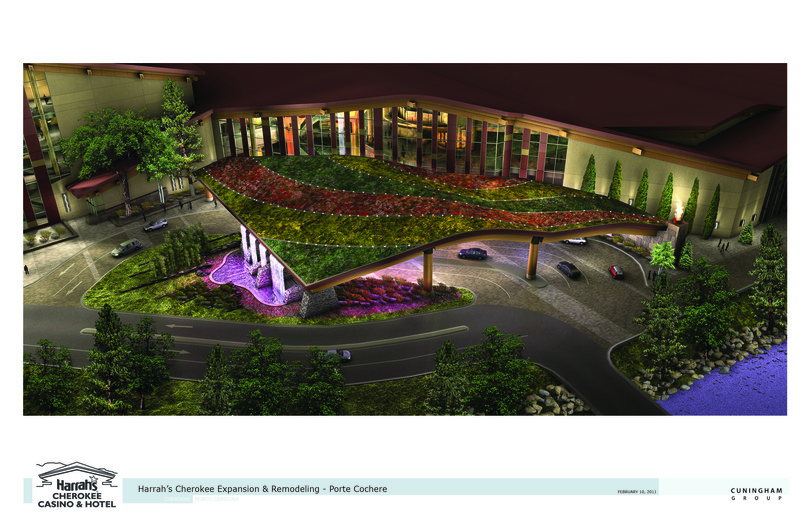 When the expansion to Harrah’s Cherokee Casino & Hotel is completed, guests will be welcomed under a spectacular green roof situated atop the canopy at the casino’s main entrance. The LiveRoof® Hybrid Green Roof System from LiveRoof®, LLC (Spring Lake, Mich.) was selected for the 22,800-square-foot project. 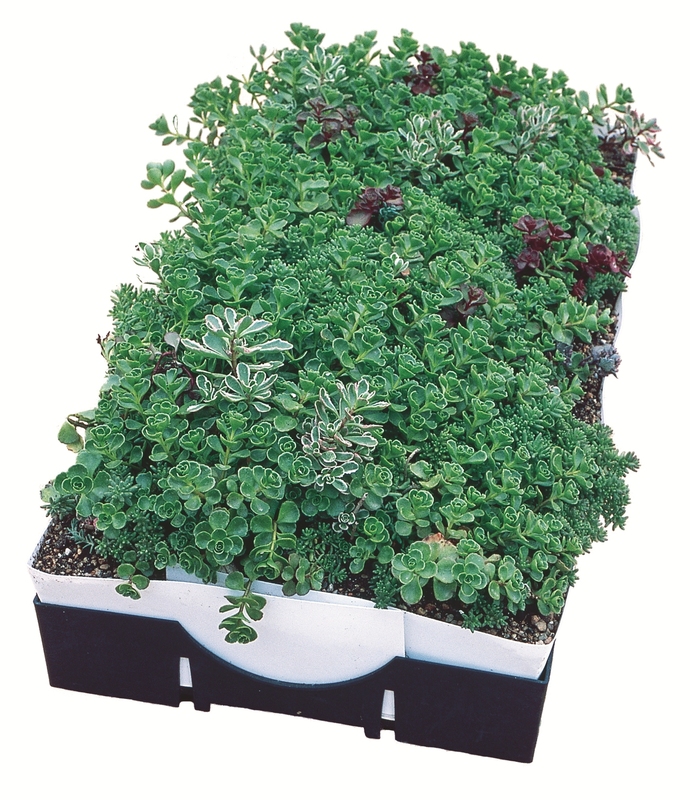 Riverbend Nursery, Inc. (Riner, Va.), a wholesale container nursery in LiveRoof’s national network of licensed regional growers, cultivated the green roof plants. The LiveRoof® Hybrid Green Roof System offers the green roof industry’s most sophisticated and horticulturally refined modules. LiveRoof modules are engineered to connect the soil between and above all modules across the entire rooftop to create a cohesive ecosystem with a seamless surface of vegetation. “The natural function of a unified ecosystem with LiveRoof provides true beauty, reliable results, sustainable growth, and trouble-free ownership with easy maintenance,” said Dave MacKenzie, horticulturalist and president, LiveRoof, LLC. Harrah’s Cherokee Casino & Hotel is putting the finishing touches on a $650 million expansion, transforming the property into a total resort destination for visitors with diverse recreational interests. The project is slated for completion by the end of 2012. An enterprise of the Eastern Band of the Cherokee Nation, located in the heart of the Great Smoky Mountains of Western North Carolina, Harrah’s Cherokee Casino & Hotel is celebrating 15 years of operation since opening its doors in November 1997. Situated on over 100 acres in Riner, Va. in the beautiful Blue Ridge Mountains, Riverbend Nursery is a progressive container grower of quality perennials, herbs, groundcovers, and ornamental grasses. A wholesale-only grower, Riverbend sells to independent garden centers, landscapers, and distributors in the Mid-Atlantic and Southeastern United States. Riverbend grows more than three million containers annually with over 1,200 varieties, produced in both heated and unheated greenhouses. The majority are propagated at the nursery facility from seed, cuttings or divisions. As a LiveRoof® licensed regional grower, Riverbend is committed to providing unsurpassed service to green roof customers in the District of Columbia, North Carolina, Virginia and parts of both Maryland and West Virginia. More information is available at http://www.riverbendnursery.com. The top horticultural experts in the industry, LiveRoof®, LLC (http://www.liveroof.com) is the only green roof company that develops plants for variety, beauty, and the ability to thrive on the roof. And every project is backed by LiveRoof’s team of dedicated, knowledgeable professionals. 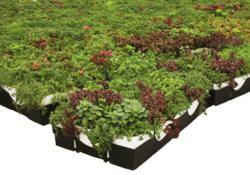 Exceptional in design and function, the LiveRoof® Hybrid Green Roof System is the most refined horticultural solution. LiveRoof establishes a healthy, sustainable ecosystem that covers the rooftop with seamless vegetation. Licensed regional growers customize plant selection for every LiveRoof project. They deliver the system’s modules abundantly vegetated with locally cultivated, full-grown plants for an instant green roof and trouble-free ownership. LiveRoof’s natural function and natural beauty offer the highest level of green roof performance with ultra-low maintenance costs. The proof is on the roof — showcased in over 600 installations that total more than two million square feet.